In an attempt to better understand spectral hallucinations, the Ecole Polytechnique Fédérale de Lausanne has managed to create a ghostly presence in their lab. It's the first time that scientists have been able to identify exactly what is happening in the brain when the feeling of another being, usually invisible, appears. 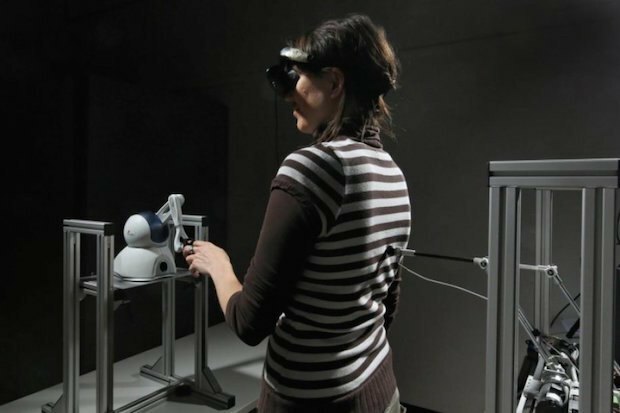 With the theory that apparitions are actually an interruption of signals that control self-awareness and spatial relation of the body, researchers used a robot to create a feeling of disconnect between the subject and his or her movements. At first, the robotic arm was synchronized with the subject's movements, touching the subject on the back whenever he or she reached out. But when researchers created a temporal delay between the subject's movement and the robotic tap, subjects reported that eerie feeling of a ghost in the room. Apparently the exercise was so successful, that some subjects were spooked enough to halt the experiment. EPFL hopes to use the research to better understand neurological and psychiatric disorders that often cause spectral hallucinations, such as schizophrenia and epilepsy.